What does the Google and Twitter partnership deal mean? Home » SEO » What does the Google and Twitter partnership deal mean? Tweets are officially back in Google’s mobile search results. The new partnership deal between Google and Twitter will allow Google to display tweets in search results in real time. 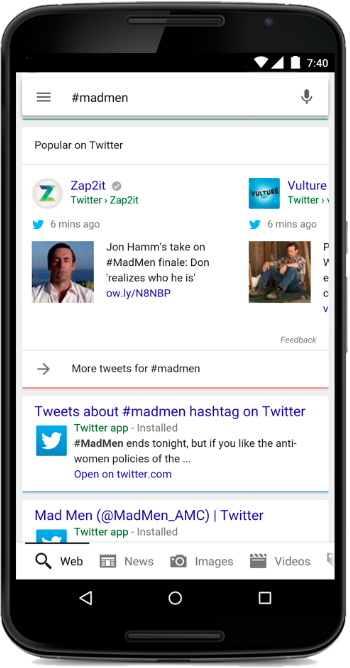 When tapping on a Tweet in Google search, you’ll be taken directly to Twitter where you can view the Tweet and discover additional content. Keen observers may remember Google and Twitter used to have a similar partnership but this ended in 2011 and I speculated that Google+ was supposed to be a replacement for this real-time social data – yet failed to deliver. SEO considerations following the Google Twitter partnership deal? On a technical note, there is a time delay between when a tweet is posted and when it becomes discoverable via Google search. Twitter now becomes a more important online channel. The partnership will undoubtedly increase the discoverability, and thus the earned media, of a given tweet. For online retailers the benefits are obvious – customers no longer need to follow a brand’s official Twitter feed to see a promotional tweet about a limited-time sales or product offer; these tweets will be readily accessible in Google’s search result. TL;DR – Brands, specifically retailers, will see a greater benefit from real-time marketing on Twitter. Search Marketing & SEO now becomes even more diverse. Online discovery has been changing significantly over the past few years. This is predominantly due to the change in the way people are using devices and accessing content. The Twitter Google deal doesn’t eliminate the obvious risks to brands on social media, if anything it expands these risks. The longevity of a tweet, meaning all those embarrassing, failed attempts to insert brands into the social conversation will be available in search to haunt those brands in the future. The old brand messages may not be the same ones they want represented in the search results lingering months or even years later. TL;DR – Search and social are now even more intertwined.